Make the single page mode initial shown replace double page-flip? Some people could still not use the single page mode. However other people begin to use the single mode to make the wide page of page look more perfectly. If you are the person who still doesn’t know how to adopt the single page mode, you could be interested in this basic tutorial because I will explain you how to switch single and double mode and how to make single mode initially shown. You know actually the flipbook always show double page as default. 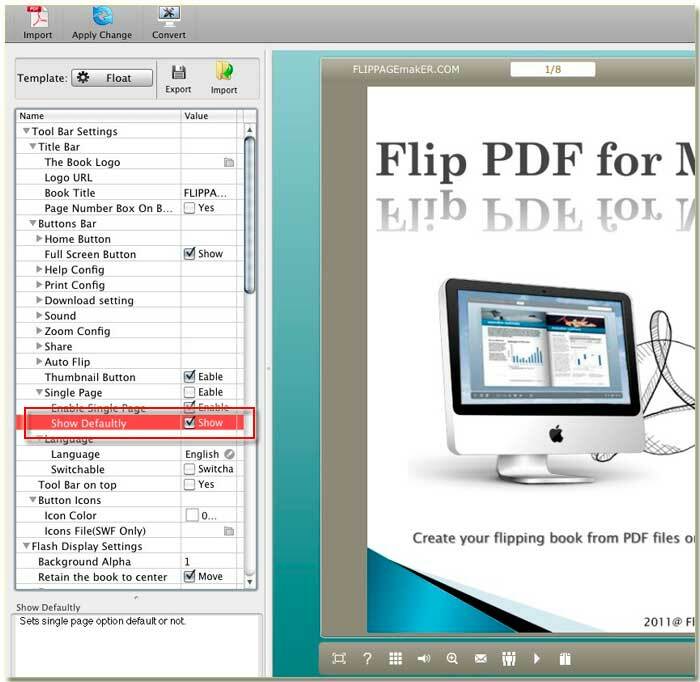 Step1: Launch FlipBook Creator for MAC, import a PDF in to understand the tutorial better. Step2: You have to find the option Single Page as the below demonstration image shown, and then check the both 2 options of Enable Single Page and Show Defaultly. If you followed all my state above, after you produce a flipbook, you can view only one page shown initially at the first sight. If you click the single-double switch button on the flipbook toolbar, you can switch the 2 modes easily.